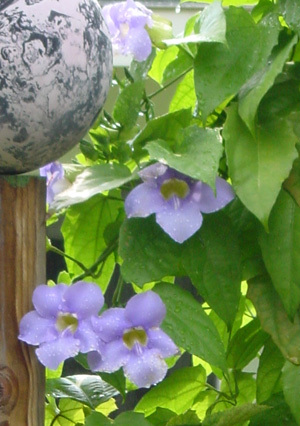 Thunbergia grandiflora, also known as Blue Sky Vine or Bengal Clock Vine is one of my favorite vines. I found one a few years ago for $6 at a local big box store nursery. I bought it not knowing what it would be like, then I planted it below my then new open fence that I designed specifically for vines. Later that year I was pleased to find large five inch beautiful soft blue flowers scattered along the fence. This vine came from tropical Africa and India. It rambles along whatever structure you provide for it, climbing as high as 20 feet in one season. Mine has never gotten out of control, but it can be a bit invasive in places without frost. This year we had a hard freeze that killed it to the ground, but I expect it to be right back up before long. It does best in full sun to part shade. Propagation is by dividing the roots, or by stem cuttings. Seeds can also be left to dry on the vine, then planted. Colors can be blue, white or lavender.